What a great week we have had in 2C. Our learning community is coming together as we learn our new routines and get to know each other. Thursday we had a practice evacuation drill and 2C, actually, the whole of the ES did a phenomenal job staying quiet and safe in the sweltering heat. We have done a great job remembering our water bottles each and every day, so thank you, parents! One thing we have noticed with our new schedule is that our afternoons after lunch are long, and we get really hungry. If you could please send your child with a little bit of an extra snack I am sure your child would be very appreciative. Tonight your child is bringing home a note regarding our second line of inquiry which is Our behaviors are influenced by our values. Students are digging into this by having an understanding of what you as a family value. Have a look in the take-home folder and please have a conversation with your child about what you value as a family, and return the sheet home on Monday to help drive our conversation in the classroom. We also have our designated Library book exchange confirmed which will be on Wednesdays. Please make sure that your child has a book bag every Wednesday. We have such a wonderful Library at our fingertips with most if not all of our home languages being represented- please take advantage of it. 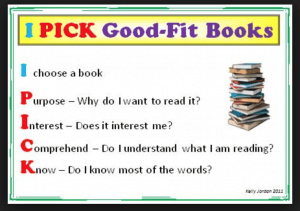 This week we have talked about “just right books” using the I PICK strategy, and this next week students will be bringing home “good fit” books for their home reading. Please remember that it is our expectation that your child reads for a minimum of 20 minutes a night or 80 minutes a week-this can be in either your home language or in English. Students will be responsible for changing their home reading books daily or as they finish them. Please help them to remember to change their books and write down the information in their reading log. *Our individual and class school photos will be on Friday, August 31 so please make sure that your child is prepared- this is the photo that goes in the yearbook. Thank you to those parents who have already signed up on Seesaw, our new digital portfolio. An email was sent on Thursday, August 23 with directions on how to do that, so please check your email. Thank you for a wonderful start to a great new school year! Your children are all very wonderful little individuals. Our new students seem to have adjusted to their new school and made some friend connections- we will continue to help make sure our “newbies” are supported for months to come. And parents we (I am) here for you should you need anything.